Primark Floral Jeans - joint blog post with Poppy's Style & Style Guile!! I decided to style mine for a night out in this post. 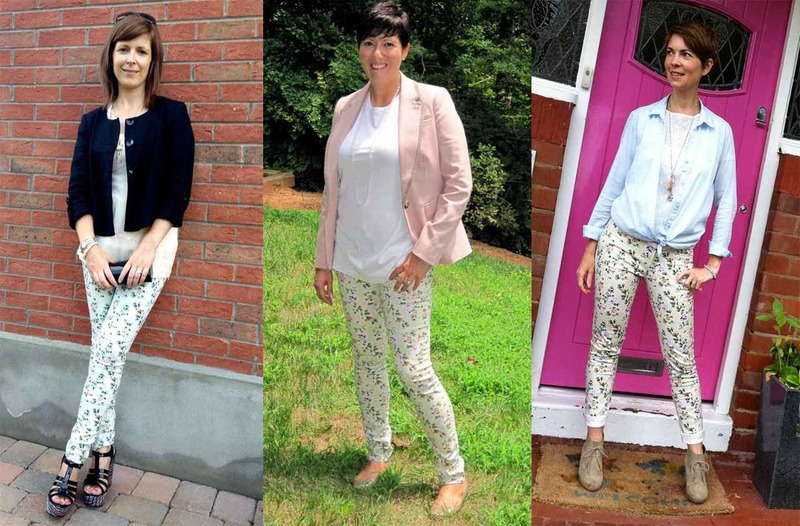 Lots of people have asked me how to wear floral and patterned jeans. The key is to make them the feature piece of your outfit and keep the top half neutral and relatively plain. But for night-time, a strong pair of jeans like these need a fierce pair of shoes so I'm wearing my fiercest - the Room 31 multicoloured wedges. I am SO in love with these shoes - thank you to the team at Room 31 for sending them to me. I had admired from afar but thought they were too high but they are actually really easy to walk in and boy do I feel amazonian in them - taller than Mr SGS! Here's a close up of the pattern of the jeans. You know, I wasn't overly fussed on them at all when I saw them first but they are a great example of the importance of trying a trend out for yourself. You sometimes need to get outside your fashion comfort zone. I LOVE them now and am so tempted to look for other patterns. Just can't stop looking down at my gorgeous jeans and fierce heels! I love every look. You look all three marvelous! Those heels are idd fierce! They look so cool Avril. I would never have thought of pairing them with patterned shoes but it works so well. I'll have to try it myself! I love floral jeans and I'm not sure why I don't own a pair myself! All three of you look GOOD!! !